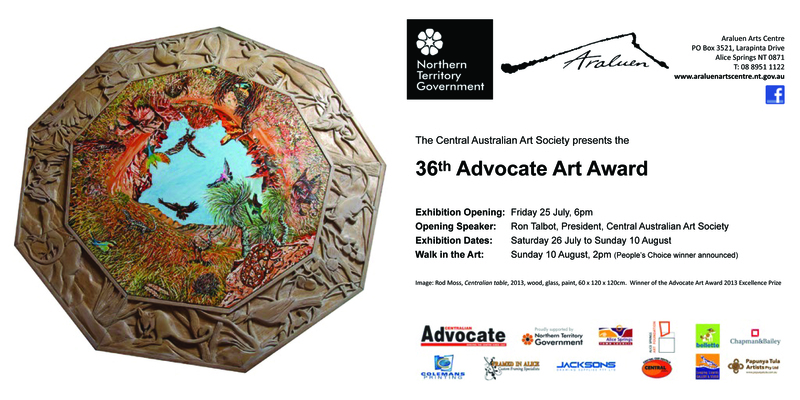 July « 2014 « Central Australian Art Society Inc.
Members and friends are invited to join us at 6PM for the Opening on Friday 25th July at Araluen, and thereafter for two weeks in Gallery One during normal Araluen opening hours. We conclude the exhibition with the traditional “Walk in the Art” commencing 2PM on Sunday 10th August. Hope to see you and do remember to vote for your favourite piece for a chance to win the art piece kindly donated by Papunya-Tula Artists. We thank all our sponsors (logos on the invitation) who make the event possible.